The 4th of July is one of my absolute favorite holidays. The kids are in the full swing of summer vacation. The weather is warm and sunny, and best of all, we’re lucky enough to be with our extended family. That means tons of cousin time for the kids (I have 12 nieces and nephews), and a chance for me to spend time with my very best friends: my older sisters and my mom. With all our family around, all the food we cook for the holiday has to be in large quantities, and cupcakes are an easy crowd pleaser. 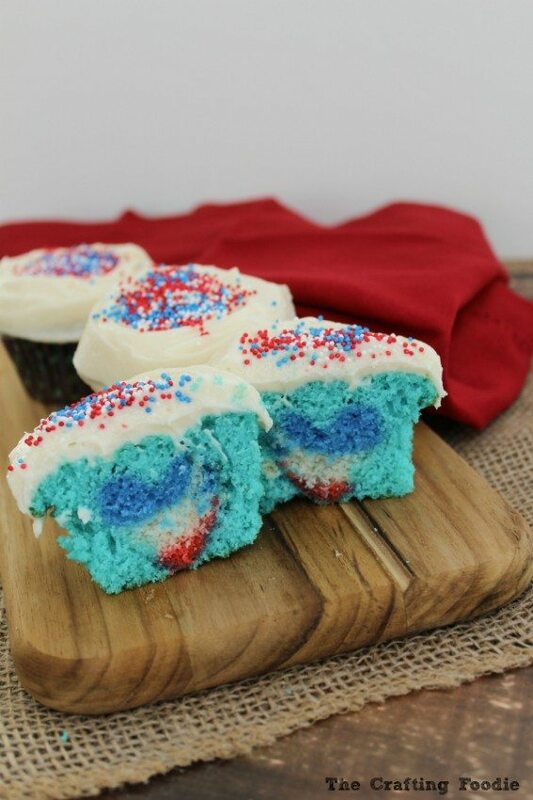 These Patriotic Cupcakes for the 4th of July are always a hit at our family barbecues. My family is a very divided when it comes to cake flavor. There are vanilla lovers and chocolate lovers, and there’s very little crossover. But, shockingly enough, most of my nieces and nephews (and my kids) prefer vanilla to chocolate. It’s pretty much my sisters and me who are the real chocoholics. 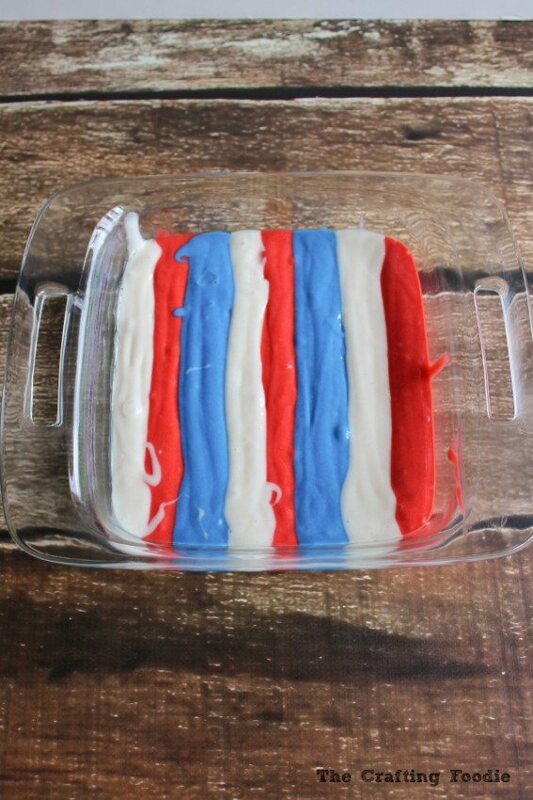 So, sacrificing for the greater good, I made these Patriotic Cupcakes for the 4th of July out of vanilla cake and vanilla frosting. 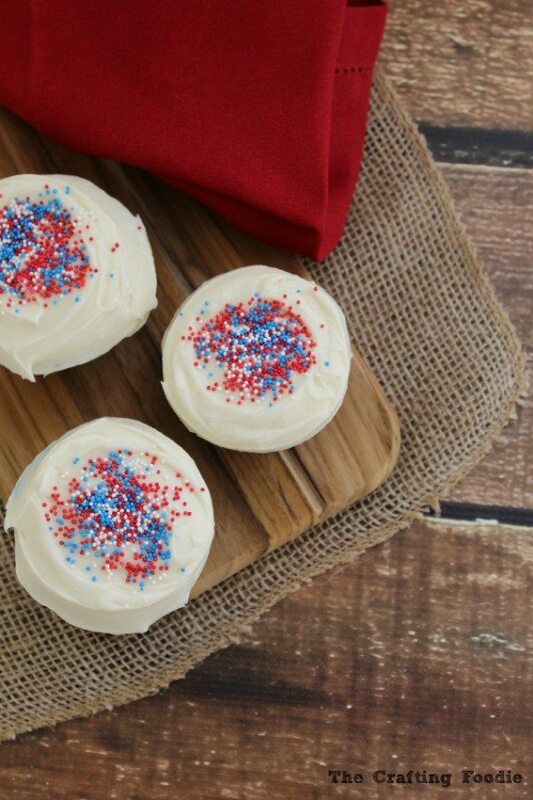 The process of making these Patriotic Cupcakes for the 4th of July is done in two distinct steps. 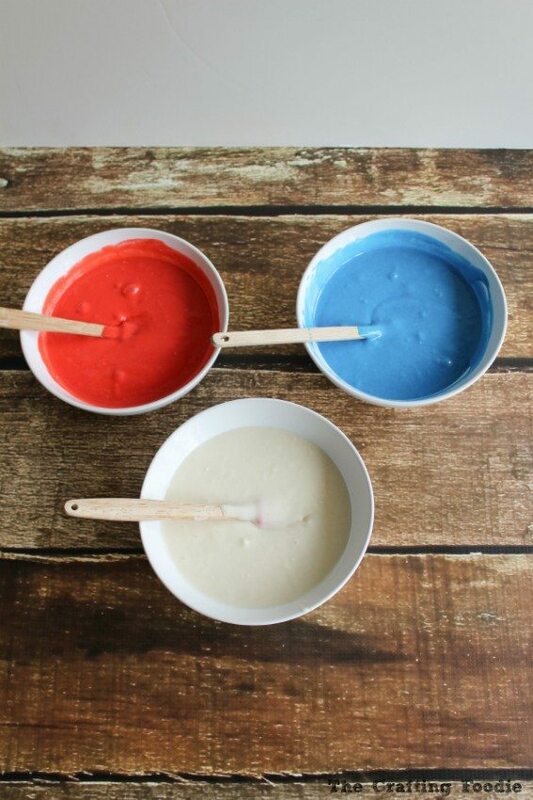 The first step involves making a red, white, and blue sheet cake. To make these sheet cake, I used one batch of this recipe for vanilla cupcakes (without the pink food color). You can also use 1/2 a batch of vanilla cake mix for this recipe. After I made the cupcake batter, I split it into three equal portions, and I colored one portion red and one blue. I left the third portion the regular batter color to represent white. One the cake was baked and cooled, I turned it out of the pan. Using a small heart cutter (about 1 1/2 inches), I cut out 12 hearts. Once the hearts were made, I used another batch of cupcake batter for the cupcakes. I tinted the cupcakes a lighter shade of blue. I filled each cupcake liner with about 2 tbs of batter, then placed one of the pre-baked hearts in the center. Then I spooned enough batter to cover the cake heart and fill the cupcake liner about 2/3 full. Then I baked the cupcakes following the recipe. Before placing the cupcakes in the oven, you need to mark your cupcake liners so that you know the orientation of the heart on the inside of the cupcakes after they are baked. So I placed a small slit on the side of the cupcake liner, letting me know where to cut the cupcake to reveal the patriotic heart hidden inside. To complete the cupcakes, just top with any frosting. I chose vanilla, and I used my absolute favorite fluffy, light vanilla frosting recipe, which you can find here. But you could use a store-bought frosting as well. 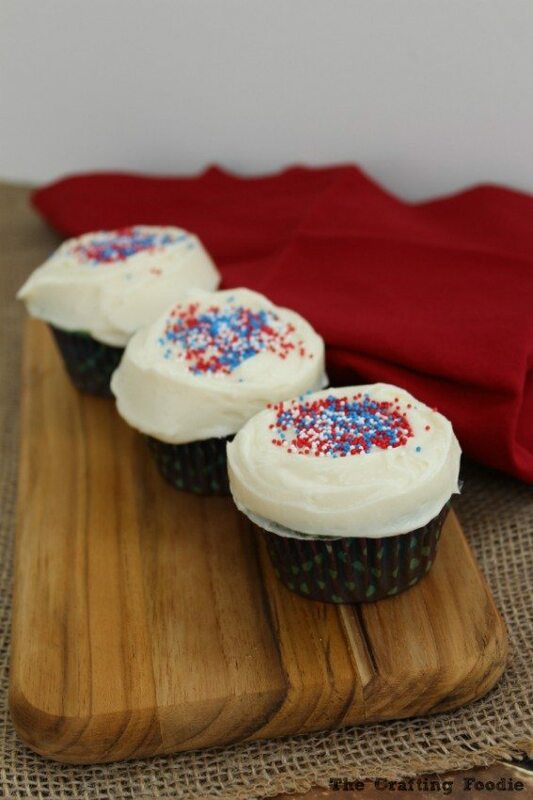 The first time I made these Patriotic Cupcakes for the 4th of July, the kids went crazy. The were so eager to see the hidden red, white, and blue heart on the inside. As a matter of fact, they were so eager that they crowded around me when I cut the first one open. It was followed by so many oooohs and aaaahs, that it made it so worth it. Then there’s my adorable nephew who’s in second grade. He could have cared less what was inside the cupcake. While his cousins and siblings were eagerly waiting for the reveal, like a little ninja, he nabbed a cupcake and devoured it while everyone’s attention was on me. If it wasn’t for his older sister, who spotted him stuffing the cupcake in his mouth, he would have gotten away with it without anyone being the wiser! 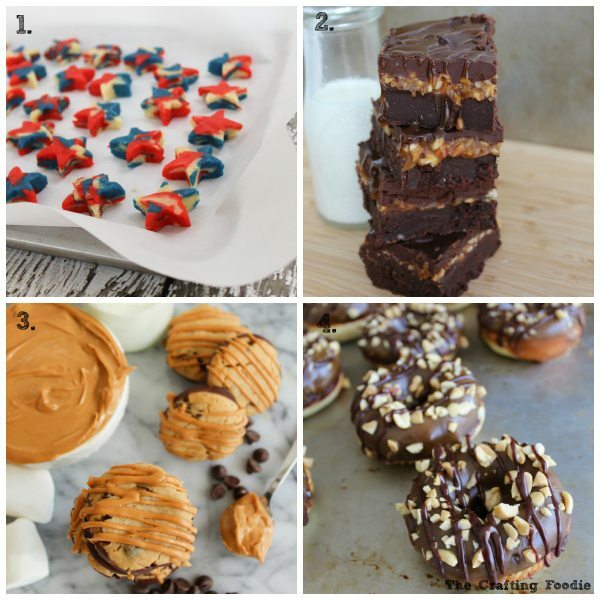 If you’re still looking for more decadent desserts and easy, healthy family meals, you can find more of my recipes on my blog, The Crafting Foodie. You can also follow me on Google+, Facebook, Instagram, and Pinterest.